Although it’s cold outside right now, giving your young gymnast a trampoline for Christmas will keep them occupied year-round, especially in the summer, for many years to come! As well as being lots of fun, trampolines can also be a valuable training aid, drill platform and conditioning tool. If you are still considering whether investing in one is the right thing to do, read our guide. 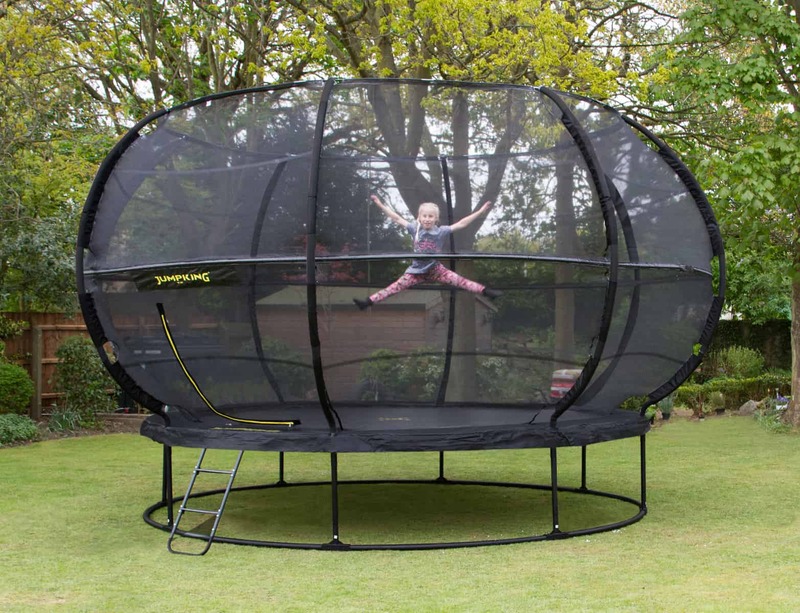 Here we have put together some of our favourite trampolines from Jumpking, the world’s largest trampoline maker. This brand is well-respected among the gymnastic community and appears at the top of ‘The Independent’ newspaper’s 2018 ’10 Best Trampolines’ list. We love Jumpking trampolines because of their excellent build quality, mid-range pricing and wide selection of shapes and sizes. They even feature a cross in the middle of the mat, which helps gymnasts with orientation and positioning whilst in the air. All of these Jumpking trampolines are available for quick delivery (order by 18th December for delivery before Christmas). For sheer wow-factor, the globe-shaped ZorbPOD can’t be beaten! This innovative design not only looks great but gives the bouncer a feeling of being inside a giant globe. as well as maximising bouncing space. The ZorbPOD sits significantly higher than average trampoline enclosures and with its all black finish scores highly in the cool stakes. 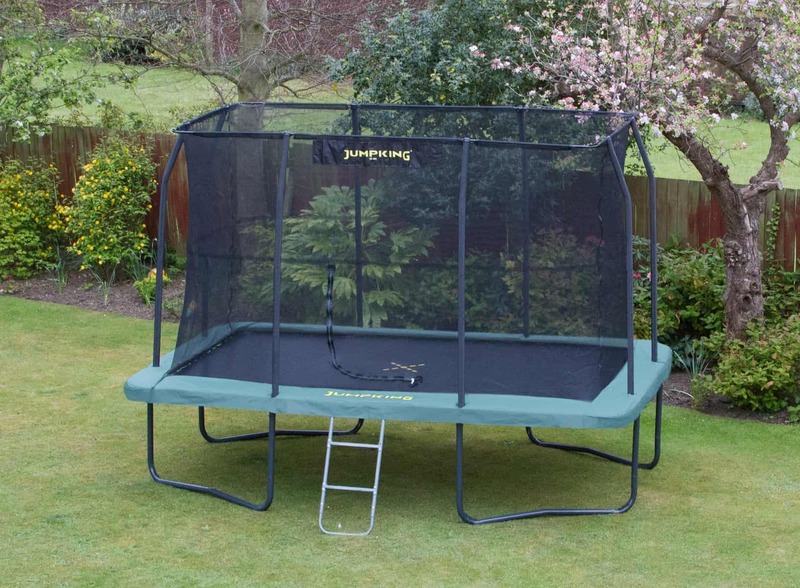 They are not for the small garden though – the 14ft model needs 17.6ft of garden space, and the 12ft model needs 15.5ft, and both require a clear space of 2.5m on all sides of the trampoline. Rectangular is the shape of choice for gymnasts. As well as being the shape they will be used to in the gym, rectangular trampolines create a more even and powerful bounce, no matter where the gymnast is placed on the trampoline mat. 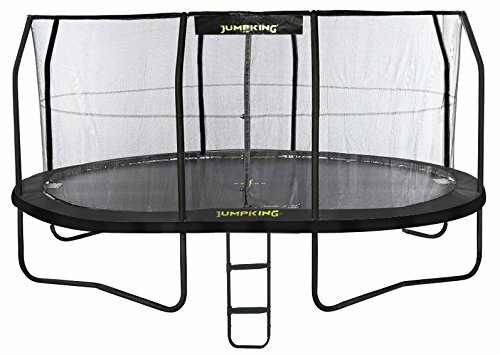 Jumpking rectangular trampolines have 3 different ‘jumping zones’, ensuring you are not drawn into the centre. Landings are more stable too. The consistent bounce means better bounce heights and overall performance, without excessive strength required. This makes them suitable for even the lighter and younger gymnasts. Many factors come into play when choosing the right size for you, including your budget and the size of your garden. With rectangular trampolines the bigger their dimensions the longer and thicker their springs will be, which means the bounce is powerful but not always achievable. Smaller trampolines allow more bounce but larger trampolines give an increased work area, allowing for a greater range of activities to be more safely practised. There is also a consideration for the age / size of the gymnast you are buying the trampoline for. If you buy a smaller model you may have to replace it with something larger as the gymnast develops and starts to need extra space for advanced moves, tumbles and aerial elements. The general advice is to go as big as you can afford and can accommodate safely, although you do need to be aware that going too big may work against a light or young child who lacks the strength at the beginning to achieve bounce. 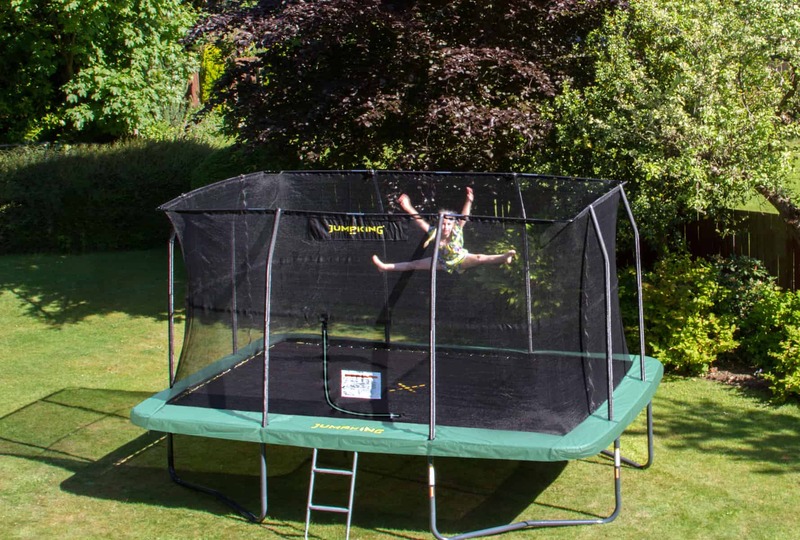 This large trampoline offers plenty of space for people of all ages! This slightly smaller model is ideal for narrow gardens yet still offers 12ft length. 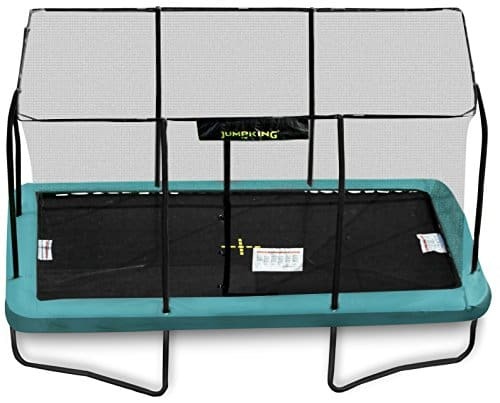 This HUGE trampoline gives a very spacious bouncing area, making it ideal for tumbling moves. Lighter children may find achieving height much harder on such a large model, but it should provide years of use! Available in ‘standard’ or ‘deluxe’ (with stronger bed, thicker pads and longer springs) versions. An oval trampoline is basically a cross between a round and a rectangular trampoline which gives a bounce type more akin to the rectangular shapes. A very large model if you have plenty of space in the garden! What do you think? Share your thoughts and experiences!